MASON CITY, IA--(Marketwire - September 24, 2010) - Vi-COR®, a manufacturer of yeast culture products for swine, poultry and dairy feed, will roll out Celmanax® SCP at World Dairy Expo (Booth EH 2417-2518) September 28-October 2 in Madison, Wisconsin. Celmanax SCP is an ultra-concentrated combination of yeast components, yeast culture, yeast extract and hydrolyzed yeast. "Celmanax SCP is processed and dried without a carrier, which eliminates any concerns of GMO issues," says Jodi Ames, Vi-COR VP/director of marketing. A growing concern among consumers regarding the impact of genetically modified organisms (GMOs) on health has led to voluntary labeling of food in the U.S. and required labeling in Europe. Vi-COR customers can confidently mix Celmanax SCP into livestock diets, knowing it is GMO-free. Celmanax SCP's launch at World Dairy Expo coincides with the introduction of a new ad campaign in dairy industry publications this month. 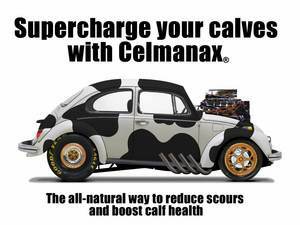 The "Supercharge your calves with Celmanax" campaign features a Volkswagon Beetle "dressed" as a dairy cow. According to Ames, Celmanax SCP will appeal to dairies who want to add it to their milk replacer or to diets that desire higher concentration inputs, as well as the poultry industry, who will add it to their feed or watering systems. Celmanax SCP is 9x more concentrated than Vi-COR's popular Celmanax Dry. Its concentrated form requires less manufacturing, making it a more earth-friendly product. It also requires less storage space and will incur lower shipping costs. In addition to developing innovative ingredients for livestock feed, Vi-COR also offers Milk to the Max, a free bilingual program for Vi-COR customers to educate dairy employees in English or Spanish on cow physiology, cow comfort and proper procedures for milking cows and how these factors affect dairy production. This program has proven especially beneficial to dairy producers with somatic cell count issues. Other courses are also available in artificial insemination, calving, hoof care, feed mixing, calf rearing and udder dissection wet lab and mastitis workshop. For more information on Vi-COR, visit http://www.vi-cor.com. The launch of Vi-COR(R)'s Celmanax(R) SCP at World Dairy Expo coincides with the introduction of its new ad campaign in dairy industry publications this month.